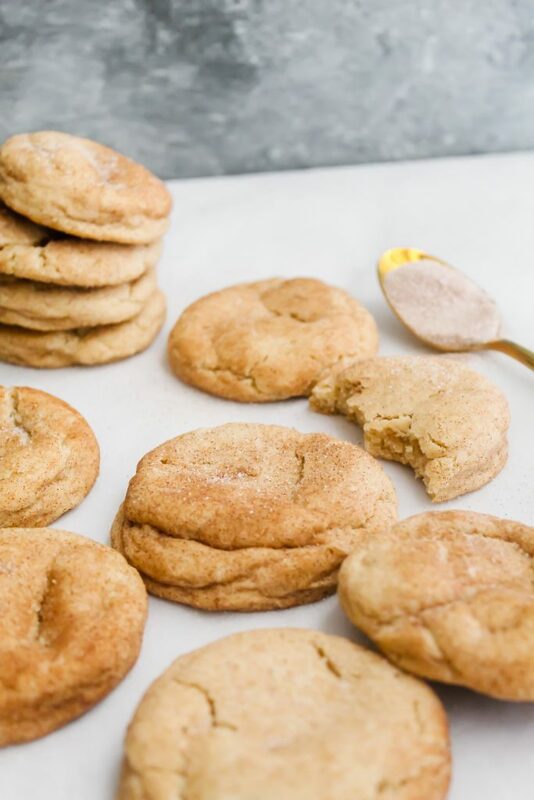 These Soft Chai Snickerdoodles are extra soft, chewy and are coated in the perfect blend of Fall spices! You won’t be able to eat just one! For about a year of my life post-college, I was a barista! 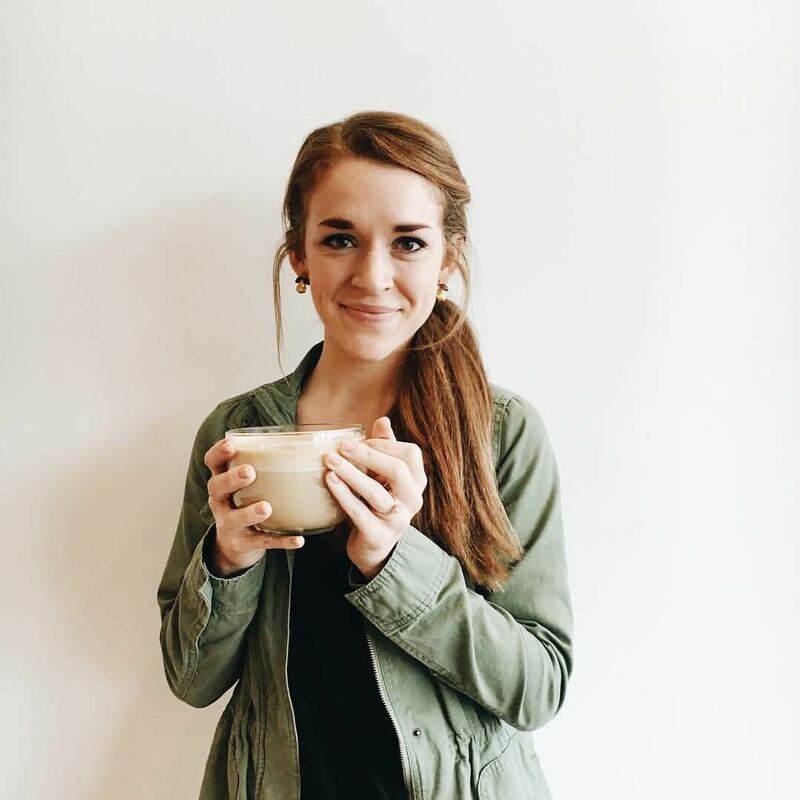 I worked at a local coffee shop in the downtown area of where I live and oh my gosh – what a time it was! I used to love waking up while all the world was still sleeping, going in and brewing up big pots of coffee and getting things ready for the day. I was like a civil servant making sure these folks were caffeinated! My husband always came with me to open up in the mornings but of course he didn’t mind. He always ended up getting some coffee out of it. Whereas I love a big cup of coffee now, at that time in my life, I could do without! My favorite, without a doubt was chai. Chai tea, chai tea lattes, dirty chais (chai latte with a shot of espresso)…the list could go on. I loved the coziness of the combination of the spices. The cinnamon, nutmeg, cardamom mixed with creamy whole milk. I was obsessed. And still am. Earlier this Fall, I made the Chai Spiced Apple Oatmeal which has been in my heavy rotation of breakfasts. Around 2 or 3 PM each day I drink a steaming hot mug of chai tea for a little caffeine boost. 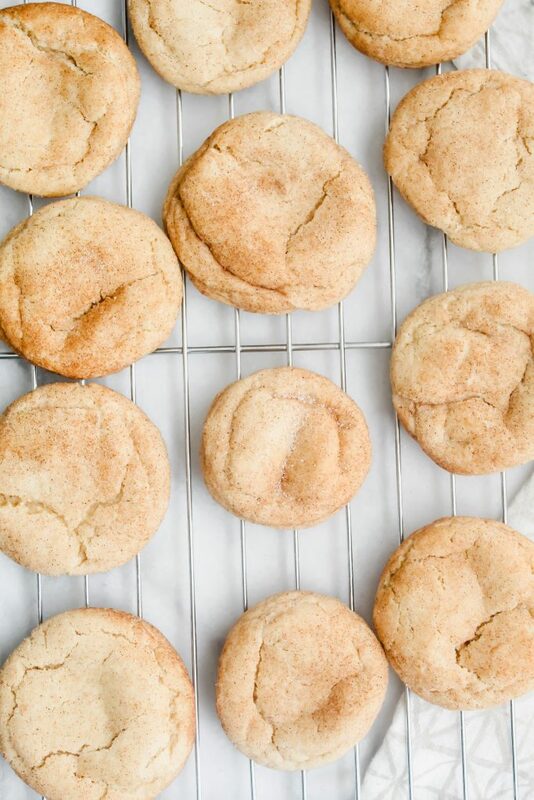 Oh, and these Soft Chai Snickerdoodles are literally the best cookie I’ve made in a looooong time. 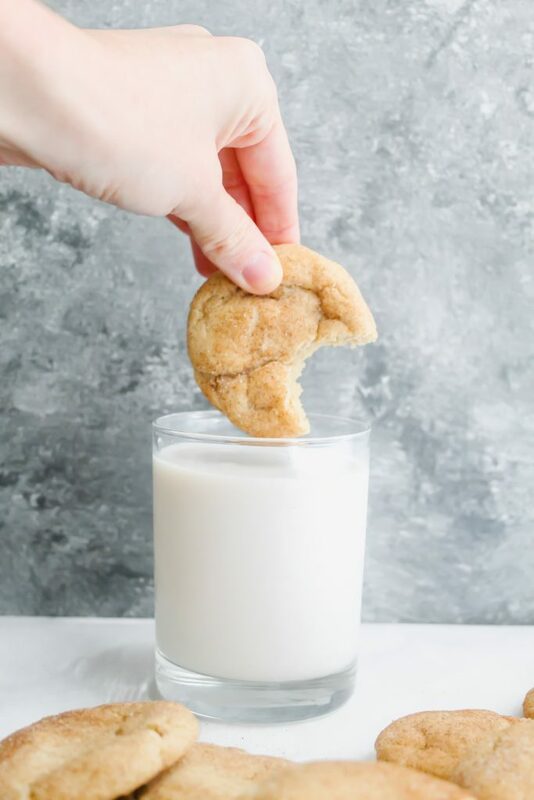 Now you guys know that based on my track record of baking cookies on the blog, such as Chickpea Flour Chocolate Chunk Cookies or my Paleo Chocolate Chip Cookie Skillet that I’m usually 100 percent a gooey chocolate chip cookie person. But these cookies literally scream HOLIDAYS in your face. You want to bake them for someone you love. 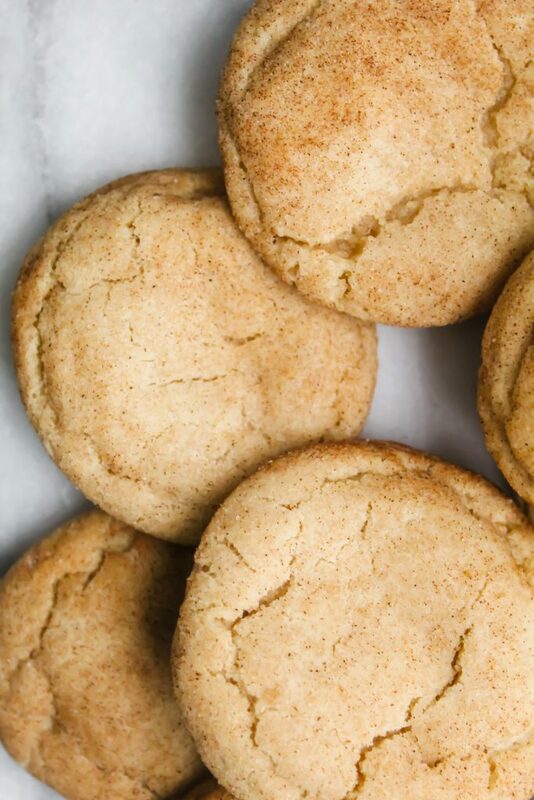 You want your entire house to smell like these cookies. You want to eat the dough. You want to eat 10 of the cookies. Yeah, they’re that amazing. These cookies are so extra soft. 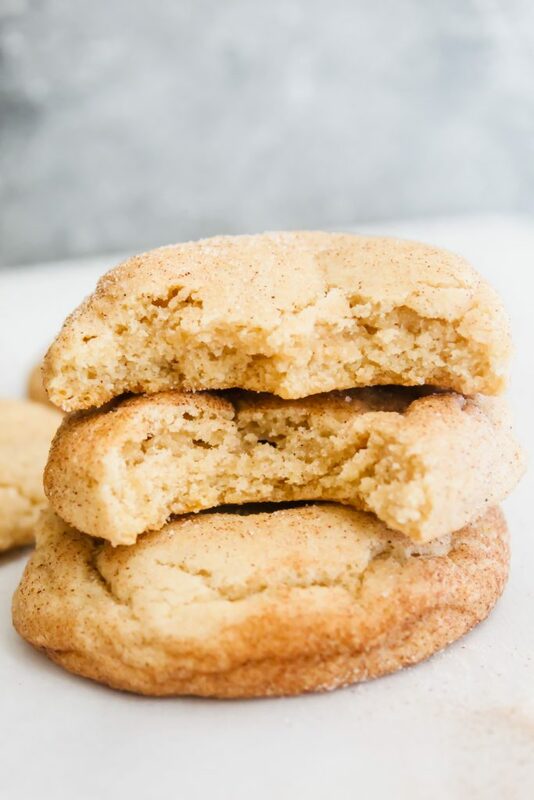 They literally melt in your mouth and the cinnamon chai sugar spice the cookies are rolled in coat your lips. 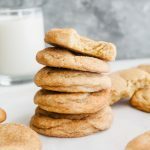 I love the extra spiciness that the chai spice gives these cookies – it just makes them that much more aromatic, cozy and zesty! Go ahead and preheat your oven to 350! While that’s heating up, mix your dry ingredients together in a large bowl. That would be your: flour, baking soda, cream of tartar, cinnamon and a pinch of salt if you’re feeling fancy. Next, in a separate bowl using a whisk, whisk together your melted butter and sugar until combined. Then add in your vanilla extract and egg and whisk again until everything is fully incorporated together. Add in your flour to your wet ingredients and incorporate with a large wooden spoon. Your dough should be pretty thick and not wet at all. You will be making the chai spiced sugar next. In a small bowl, add in your sugar, and chai spices. Mix together until fully incorporated. Cover your baking sheet with either silicon or parchment paper. Using a cookie scoop, evenly scoop out about 6 or 7 cookies. Roll the dough in a ball using your hands. Take your ball of dough and plop it into your bowl of chai spiced sugar. Roll it around until it is evenly coated with the sugar mixture. Then place it on the baking sheet. I baked 6 cookies at a time on my baking sheet. Bake for 11-12 minutes. Once they’re done, take them out and let them sit without touching them for about 5-7 minutes. After that, move them to a cooling rack! Try not to eat all in one setting. Repeat these steps until your dough and chai sugar is all gone! Use salted butter! I never use unsalted butter in my baking recipes because I think the extra bit of salt really gives it a depth of flavor it wouldn’t otherwise have. Let your egg get to room temperature! I usually never have the patience for this – but I think it really helped in binding the dough together and producing a really delicious thick cookie. Roll your cookie dough into the SAME size balls. 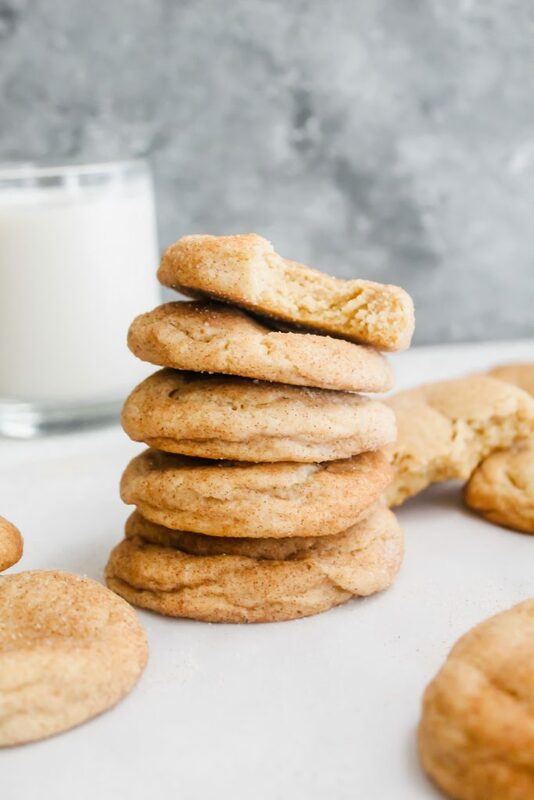 Even though I wouldn’t be opposed to a giant Soft Chai Spiced Snickerdoodle…doing this step ensures that your cookies cook more evenly. Don’t eat all the raw dough! Does anyone else need to remind themselves of this step every single time they bake? Or is it just me? Enjoy these warm out of the oven with a big cold glass of milk. They’re the absolute best. Preheat oven to 350 degrees. Line a baking sheet with either silicon or parchment paper. Mix your flour, cream of tartar, baking soda, and cinnamon together in a bowl until incorporated. In a separate bowl, whisk together your melted butter with the granulated sugar and brown sugar until fully incorporated. Add in the vanilla extract and egg. Mix together. Add the dry ingredients to the wet ingredients and mix together with a large spoon until combined. Your dough should be dry. In a small bowl, mix together your chai sugar spices until combined. Using a cookie scoop, scoop a mixture of the dough, roll it in your hands until a ball forms. 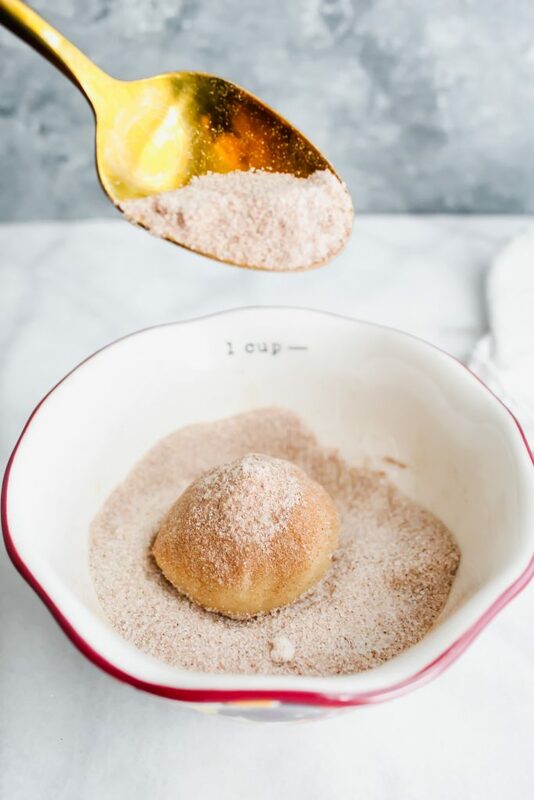 Coat the ball of dough in the chai sugar spice until it's evenly coated. I baked 6 at a time on the baking sheet. Bake for 11-12 minutes. Take out of oven and let sit on the baking sheet for about 5-7 minutes to cool. After, transfer to a cooling rack. Continue baking until dough is gone. Makes about 12-14 cookies. Eat while warm! Enjoy! These look so beautiful and pillowy soft! I wish I could bite into one. 🙂 Great job, Haylie! Awww! Thank you SO much for your sweet comment, Emma! 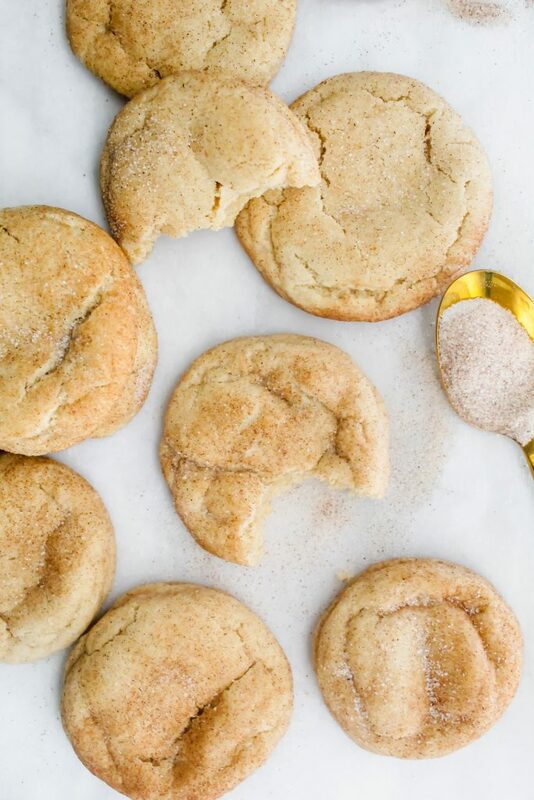 I’m a bit embarrassed to say that I’ve never tried a snickerdoodle cookie! I need to change that! These look so soft and chewy Haylie. Irresistible! Thank you so much, Leanne! You definitely need to try one this holiday season! It’s a classic cookie!! Haylie, this is your husband, Ben. Please make these cookies again, very soon. Hahahah! Anything for you, honey.